A snowmobile is a vehicle that provides fun and recreation, weekend excursions and trail riding with family and friends, and in some cases, the main method of transportation available. The snowmobile has utilitarian purposes as well for the following individuals; farmers, ranchers, loggers, power line crews, conservation officers, police, trappers, and others. 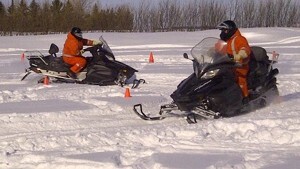 A snowmobile is designed to be a safe vehicle when used as intended. The key to safe operation is YOUR knowledge of the vehicle; recognizing and accepting it as a motorized vehicle; respecting its capabilities and its limitations; varying operating conditions; knowledge of local laws; good judgment and courtesy. Recognizing your own capabilities and limitations is also a very important factor for the safe operation of a snowmobile. Although the snowmobile is a relatively simple vehicle to operate, its simplicity and ease of operation are contributing factors to many incidents. From our analysis of incident situations, we have found that in most cases, at the time of the incident, the operator was either inattentive, careless or uninformed about safe operating procedures. A class 5 or higher drivers license is required for this course. All these skills are taught and practiced in the field. Riders will get hands-on skills. Course Length: The course length including the theory and practical session is approximately 8 hrs. Course Completion: Trinity Safety will issue each student a certificate. The Occupational Health and Safety Act, 1993 and The Occupational Health and Safety Regulations, 1996 Section 19(1) An employer shall ensure that a worker is trained in all matters that are necessary to protect the health and safety of the worker. 19(2) The training required by subsection (1) must include 19(2)(a) procedures to be taken in the event of a fire or emergency.